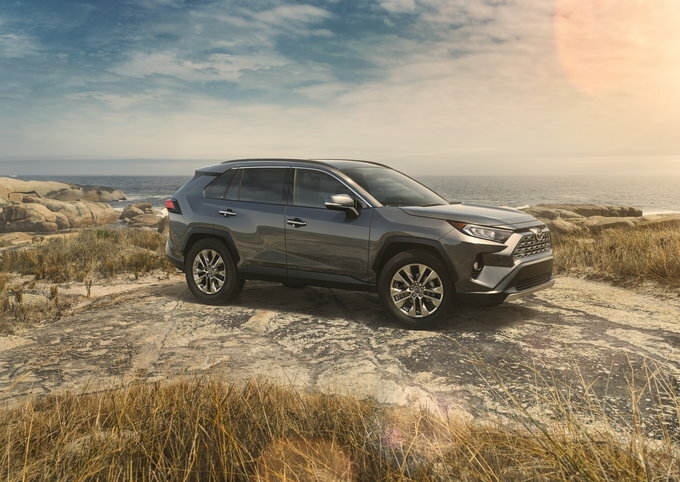 The redesigned 2019 RAV4 with its more rugged design, more power, and more trim levels is in showrooms now. The 2019 RAV4 starts from $26,545 (destination fees included) and has a few attractive deals. We expect the 2020 Toyota RAV4's production to start in September 2019 for a November on-sale date. The 2020 RAV4 will be a carryover model. Toyota's deals are regional and expire on April 30, 2019. All deals mentioned here assume a Southern California location unless otherwise noted. Keep an eye out for updated deals on the RAV4 around Memorial Day. The 2019 RAV4 LE 's 36-month lease remains at $299 per month with $1,999 due at signing (12,000 miles per year). With an effective monthly cost of $355, this is not a good deal considering its MSRP. Keep an eye on this space, as the lease price could fall later in the model year. 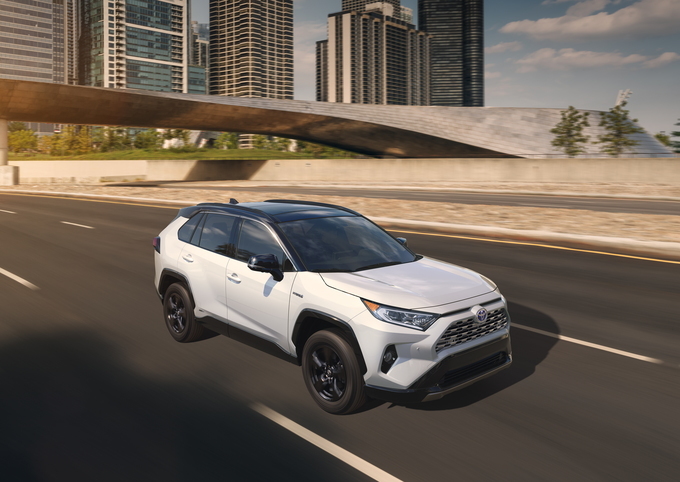 The 2019 Toyota RAV4 has a $1,000 rebate for financing through Toyota Financial. The 2019 RAV4 has no APR deals yet, but this should change soon. The 2019 Toyota RAV4 is a compact crossover utility vehicle with room for five. This model has one powertrain choice and is available in standard front-wheel drive or with optional all-wheel drive. As an all-new model for 2019, Toyota presents the RAV4 in five trims with several package upgrades available. The 2019 Toyota RAV4 is a complete redesign, which launches the fifth generation of this small crossover. The new model is slightly longer, features a more rigid body, and has an updated powertrain. Additional safety features and updated all-wheel-drive systems with a Multi-Terrain Select drive control round out the top changes for the year. Toyota markets a RAV4 Hybrid variant separately. The 2019 Toyota RAV4 is available in LE, XLE, XLE Premium, Adventure, and Limited trims. All models are powered by a 2.5-liter four-cylinder engine with 203 horsepower and 184 pound-feet of torque paired to an eight-speed automatic transmission. Models equipped with front-wheel drive achieve an EPA-estimated 26 miles per gallon city, 35 mpg highway, and 30 combined. Adding all-wheel drive, which is $1,005 on LE, XLE, Premium, and Limited trims and standard on the Adventure, drops fuel economy to 25/33/28 mpg (city/highway/combined). Standard features include LED headlights, 17-inch steel wheels, roof rails, dual exhaust tips, and power side mirrors. All models come with full power accessories, a climate control system, an infotainment system, and driver-assist safety features. Toyota prices the RAV4 LE from $26,595 (all prices include the $1,095 destination charge). This trim comes with automatic LED headlights and daytime running lights, fog lights, a power moonroof, 17-inch steel wheels, power side mirrors, and dual-tip exhaust outlets. Other standard features include keyless entry, power windows and door locks, a tilt-and-telescoping steering column, cloth seats, climate control, a six-speaker audio system, USB and auxiliary ports, Bluetooth connectivity, and driver-assist technologies. The LE trim offers a Blind-Spot Monitor with Rear Cross-Traffic Alert Package ($590). Add a rear cargo area cover and your cost rises to $680, while the cover is available on its own for $90. Priced from $28,395, the RAV4 XLE adds such features as 19-inch alloy wheels, upgraded cloth seats, a power driver’s seat, and a blind-spot monitor with rear cross-traffic alert. The XLE Convenience Package ($1,295) adds an eight-way driver’s seat with lumbar support, heated front seats, and a power liftgate. The same features with an upgraded Entune 3.0 Audio Plus system with six speakers, additional USB ports, Siri Eyes Free, and Apple CarPlay is available for $2,335. Get all of that with HomeLink, a clearance sonar, and rear cross-traffic emergency braking for $3,200. With AWD, buyers can access the $485 Weather Package that bundles a heated and leather-trimmed steering wheel, rain-sensing windshield wipers, and a de-icer function. The XLE Premium trim costs $30,595 and brings upgraded 19-inch wheels, a power liftgate, imitation leather seats, and a leather-wrapped steering wheel. The XLE Premium is available with the XLE Premium Grade Weather Package ($1,075) which includes the aforementioned Weather Package's features plus heated front seats and an eight-way power driver's seat with memory. Meanwhile, the Entune 3.0 Audio Plus system costs $1,620, while it and the Weather Package are bundled together for $2,695. The upgraded audio system and a Technology Package (clearance sonar, rear cross-traffic emergency braking,and HomeLink) costs $2,885, while those two plus the Weather Package contents runs $3,960. Starting at $33,995, the RAV4 Adventure is the only trim with standard all-wheel drive. This model is outfitted with matte-black 19-inch alloy wheels and comes with a two-mode all-wheel-drive system. A moonroof is offered for $850, while the Adventure Grade Weather Package ($1,185) adds ventilation to the seats in addition to the features found on the XLE Premium's Weather Package. These two together cost $2,035. The upgraded audio system and moonroof are bundled for $2,470, while the Weather, audio system, and moonroof cost $3,655. The Technology Package, upgraded audio system, and moonroof are packaged together for $3,735, while adding the Weather Package to that mix ups the cost to $4,920. The RAV4 Limited is priced from $34,595. It comes with chrome-accent door handles with touch-sensor lock and unlock. 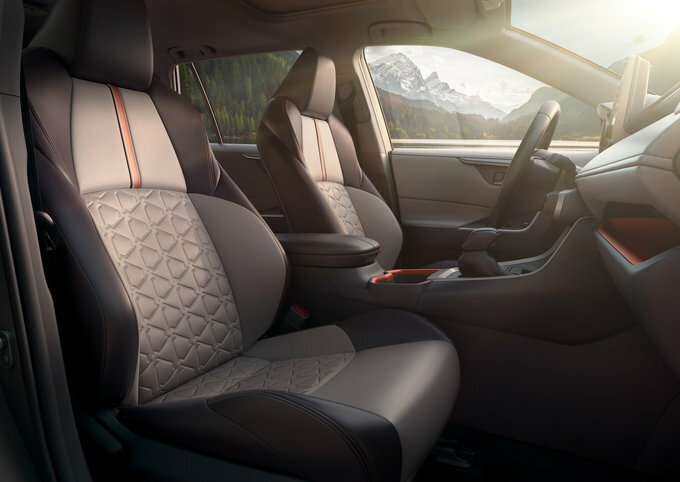 An advanced keyless entry system, upgraded imitation leather seats, a sonar system with rear cross-traffic braking, and a navigation system round out the differences here. Available packages include the Entune 3.0 Premium Audio system ($580), Limited Grade Weather Package ($1,015), or both for $1,595. Buyers can also bundle the Technology Package with the audio system ($1,605), the Technology Package, audio system, and moonroof ($1,805), the Technology Package, Weather Package, and audio system ($2,620), Technology Package, Weather Package, and audio system ($2,620), or Technology Package, Weather Package, audio system, and moonroof ($2,820). The 2019 Toyota RAV4 makes the necessary improvements to remain one of the top sellers in its segment, competing with the Nissan Rogue, Honda CR-V, Ford Escape, Chevrolet Equinox, and others for customer attention. The standard Toyota Safety Sense 2.0 suite includes adaptive cruise control, lane departure alert, and a pre-collision system with rear cross-traffic alert. Start your search with the base trim and you’ll find a lot of value for the money. All-new, rugged crossover. 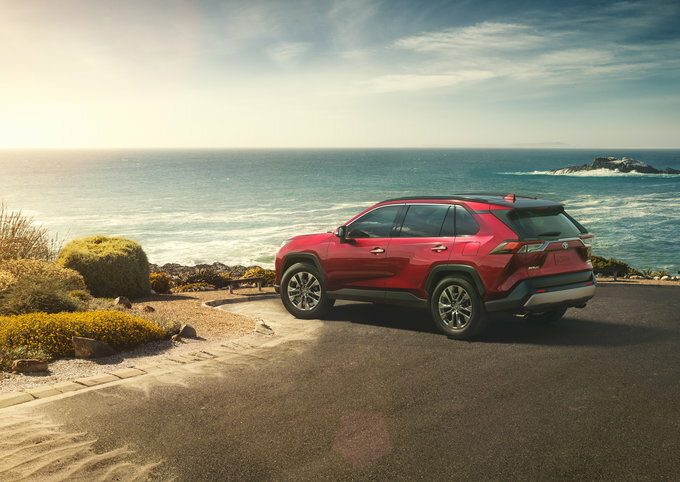 The 2019 Toyota RAV4 rolls in with a brand-new look and feel that harks back to the old days of compact SUVs – a segment this model helped launch back in 1994 – that offered compact footprints and some off-road capability. While the RAV4 remains a crossover, it takes on a sharper, more off-road-ready look that includes a more upright stance, sharper body lines, a higher ride height, and other cues from the Toyota Tacoma and Toyota 4Runner. This strikes a nice balance between comfier crossovers and more rugged SUVs. Rugged looks with a soft side. One look at the 2019 Toyota RAV4 makes it clear the automaker wanted to abandon the straight soft-roader look of yesteryear and adopt a more rugged take on the segment. This new off-road-focused suit contrasts the rest of the class nicely, ensuring the RAV4 stands out in a sea of vanilla. But it’s not all about ruggedness. The RAV4 still has the softer side crossover buyers seek. 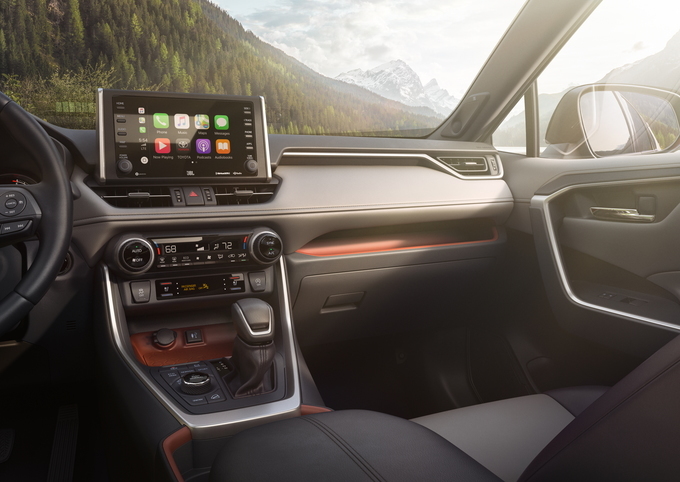 Its cabin is well equipped even in base LE form, which comes with a seven-inch touchscreen, Apple CarPlay and Android Auto integration, Bluetooth, USB ports, and more as standard. Some compromise is necessary. While that rugged exterior is sharp, there's a bit of a compromise buyers must make inside. The low roofline on the RAV4 intrudes on interior space, cutting head room to just 37.7 inches with the optional panoramic sunroof. This makes even average-height drivers feel a little too close to the headliner for comfort. Hauling cargo and people? 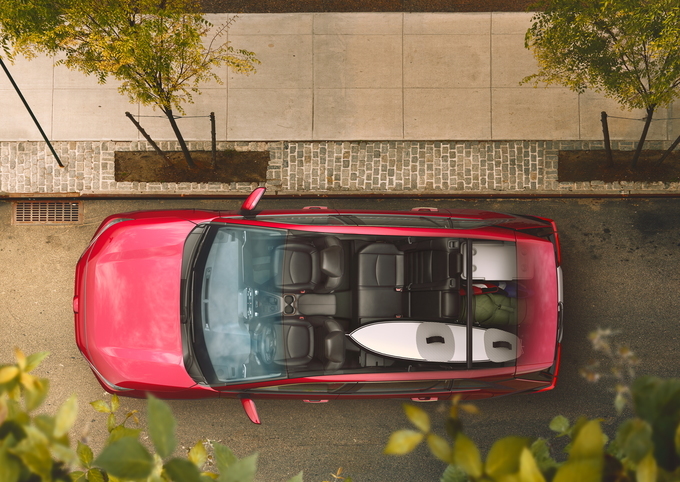 The RAV4 excels with up to 37.5 cubic feet of room with the rear seats up. However, its roughly 57 cubes with the rear seats folded falls well short of the Honda CR-V and Subaru Forester at 75.8 and 76.1 cubic feet, respectively. It's also short of the Ford Escape’s 68 cubic feet and the Kia Sportage’s 60.1 cubes. Safety for the win. Safety has become a huge deal for Toyota lately. The automaker has made advanced safety features part of the standard equipment in most of its new cars, and the RAV4 is no exception. 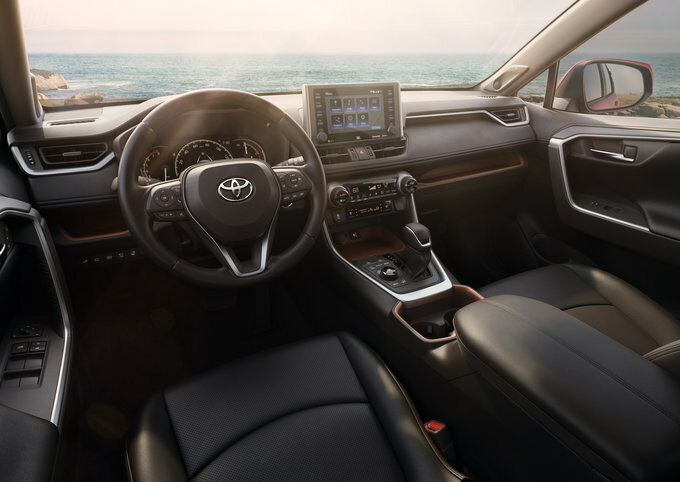 While we’re still waiting on official crash-test data from the IIHS, Toyota equipped the 2019 RAV4 with all the standard active safety tech it needs to be a Top Safety Pick Plus, including forward- and rear-collision warning, lane departure warning, lane keeping assist, rear parking sensors, a rearview camera, adaptive cruise control, and automatic emergency braking. 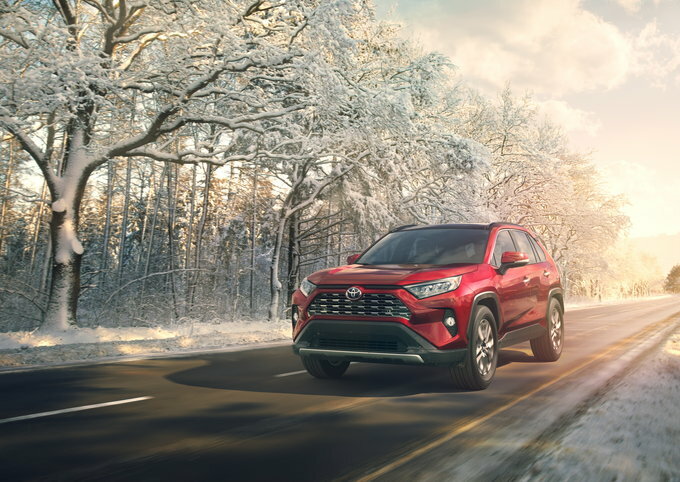 Also, drivers in cooler climates will find the RAV4’s base all-wheel-drive system adequate, but the available torque-vectoring all-wheel-drive system delivers impeccable slick-road handling. This system also enhances off-road handling and on-road cornering. The torque-vectoring all-wheel drive is standard in the RAV4 Adventure and optional in the Limited trim. Final thoughts. The 2019 Toyota RAV4 does so many things right that it meets the needs of virtually any buyer. One particular standout is the more rugged Adventure trim with its advanced all-wheel drive, off-road-focused wheels and tires, and traction-management system, which make it perfect for off-road enthusiasts who also use this rig to commute to work and soccer practice every day. Sure, there are models with more power, like the 2.0-liter-equipped Escape and Sportage, and others with more cargo room, like the Forester and CR-V, but few check as many boxes as the RAV4.